The Artisan's Asylum has a few guiding principles, one of which is anyone can "make." We assume one of the others is "you can never have too many hexapods." If Stompy, the giant rideable bot, is a bit much for you to handle (or store), then maybe Hexy is more your speed. He's got six legs and 20 servos, but at only $200, he's much cheaper than similar hexapod kits and, most importantly, more adorable. The bot is the brain child of Joseph Schlesinger, a resident at the Somerville hacker space who saw a need for a low-cost but serious robotics kit. Since hitting Kickstarter in May, his creation has raked in roughly $86,000 in pledges, far surpassing his original goal of thirteen grand. We swung by Joe's booth to get a taste of what exactly his hundreds of backers have bought into and to find out what's next for the budding bot entrepreneur. The basic components of Hexy are pretty standard stuff: a pile of laser-cut acrylic, a bunch of servos, an ultrasonic distance sensor and an Arduino-compatible microcontroller with enough servo controlling pins to turn your hexapod into an octobot with room to spare. The whole ensemble is light, and seems simple enough to customize, enhance or repair. Of course, that's the whole point. 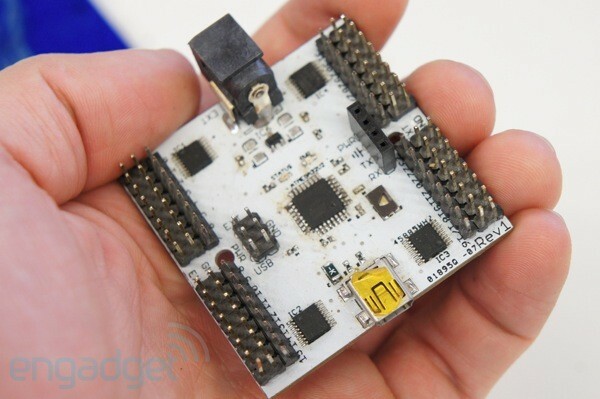 The designs are completely open source, so anyone can simply take the plans and build their own Hexy. But it'll probably cost them quite a bit more than embracing the community buying power that Schlesinger has amassed. 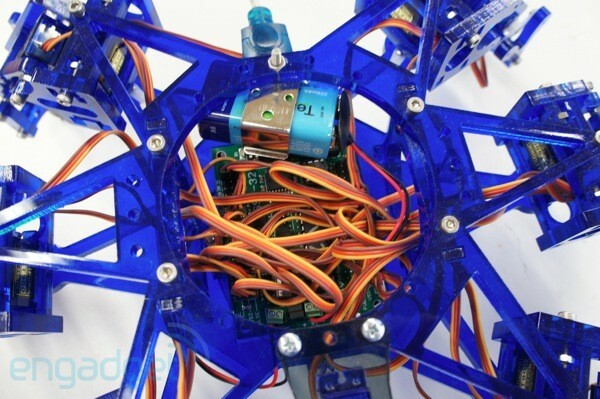 One of the most impressive things about the little hexapod is just how affordable he is. Most other "cheap" kits, weigh in at around $700. Part of that cost savings comes from just how much the creator has invested in the project himself. Rather than outsource the manufacturing of all his custom acrylic parts, he purchased a $20,000 laser cutter and produces them himself. Which also means that, as more orders roll in he'll probably be able to shave even more off the price. The current model is controlled via a simple application running on a PC that triggers maneuvers via a USB cable. Expanding the bots repertoire is as simple as writing a new move in the program's code -- a button to execute it is automatically generated. Obviously, the more adventurous could easily program automated acts using the included ultrasonic eyes, or other sensors could be added via the available pins. Schlesinger isn't happy yet though. As more money rolls in he's expanding his plans. Even though he's reached his initial goal, there's still two more weeks of life left to his Kickstarter. If he can amass pledges worth $200,000 he'll work to develop a drag-and-drop programming GUI based on miniBloq, significantly lowering the barrier for entry. And, if that's not enough programming options for you, at $250,000 he whip up Android and iOS remote control apps. If you'd like your own Hexy and want to help push the project towards that magical $200,000 marker hit up the source link.